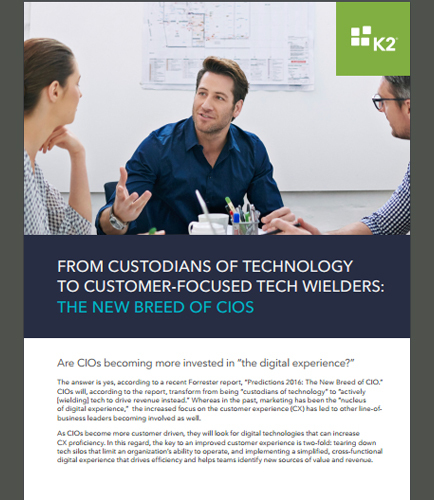 Are CIOs Becoming More Invested in the digital experience? "Are CIOs Becoming More Invested in the digital experience?" Are CIOs becoming more invested in “the digital experience?” What kind of digital transformation strategy is needed to drive this experience? To drive digital transformation and growth, CIOs should be digitally savvy and obsessed with CX proficiency. In the future, they might face challenges stemming from more sophisticated business demands, and it's important to respond to those with agility, efficiency and organization. Download this whitepaper and find out how flexible business transformation platform can improve customer-facing processes and accelerate revenue.